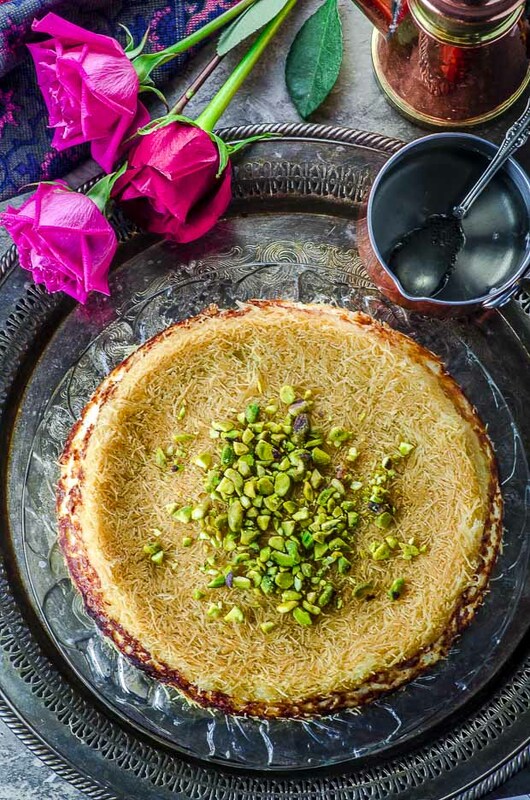 You are here: Home » Desserts » Knafeh – Move over cheesecake, there is a new player in town! This post is made in partnership with Natural and Kosher – All opinions are our own. Thank you for supporting the brands that keep the May I Have That Recipe sisters cooking! 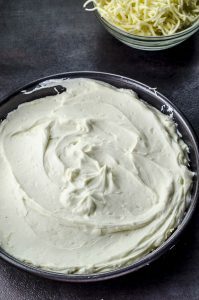 It’s that time of year when mealtimes are more relaxed, fresh salads take center stage, and you need a show-stopping dessert that will mesmerize your guests into thinking that you really were in the kitchen all day. Enter, knafeh! 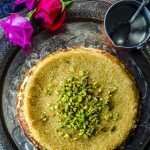 Knafeh is a popular Middle Eastern dairy dessert that is a rich, filling golden-pie indulgence that will put other Memorial Day BBQ and Shavuot desserts to shame. 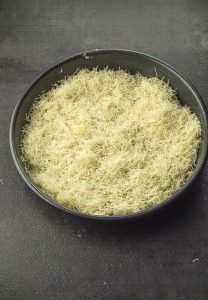 Knafeh is made by sandwiching simple dairy ingredients (ricotta and mozzarella cheese) between two layers of kataifi (ka-tee-fee), the shredded phyllo dough sheets that are often used in some types of baklava and are found in the frozen food sections of larger supermarkets, gourmet stores, and Middle Eastern and Greek grocers. We like to use the Athens and Apollo brands. 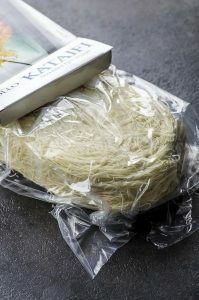 Make sure you thaw Kataifi in the refrigerator before using. 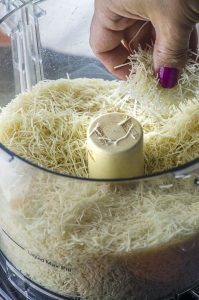 We grind the kataifi in the food processor, then mix it well with butter so that it is pliable and can be pressed into a round cake pan. 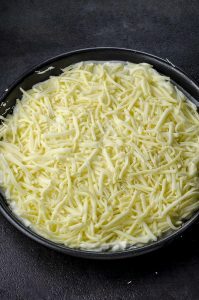 We then add in ricotta cheese, sugar and shredded muenster or mozzarella cheese. 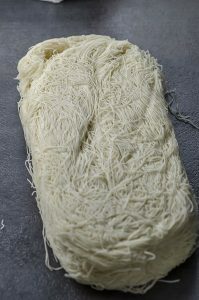 We use the remaining katafi to add a top layer to the cheese filling, then bake until golden brown. Once in the oven, we prepare a 10-minute Orange Blossom Syrup using sugar, water, lemon and orange blossom water (also available at gourmet shops and Middle Eastern grocers). The Orange Blossom Syrup, give this dessert some floral note, but you can skip it and just use the lemon juice. Pour the syrup on top of the knafeh as soon as it comes out of the oven. Once cool, garnish it with crushed pistachios. 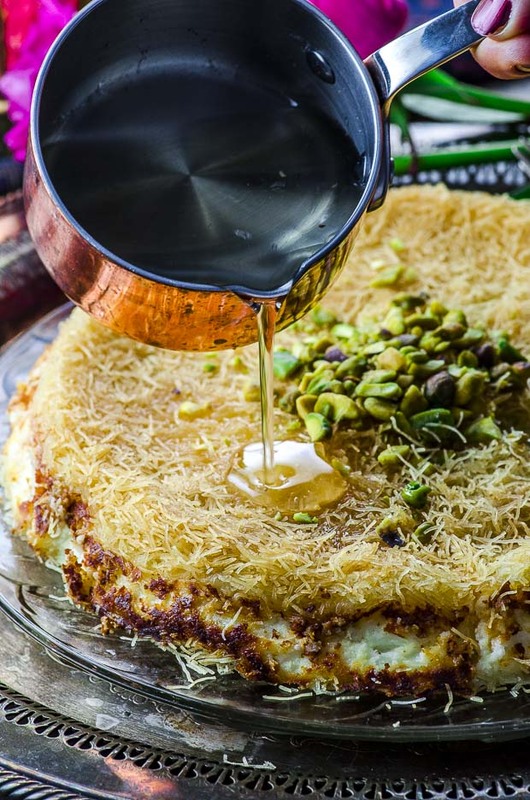 Serve the knafeh hot so that each golden-brown piece features deliciously melted strings of cheese, sweet syrup, and pistachios. You may want to try some of our other Middle Eastern desserts to serve alongside the knafeh as well like our Vegan Halvah Bars, Fig and Tahini Truffle Tarts, or our Pomegranate Tahini Cupcakes. Add a pot of coffee (try exotic Turkish coffee! )and a large bowl of mandarin oranges and your guests will compliment you for days. 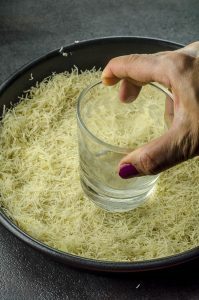 Did you like this recipe for Knafeh ? Leave us a rating! Did you love it? Share it or leave us comment on Twitter or Facebook! Wanna see more? Subscribe to our blog and remember to follow us on Pinterest! 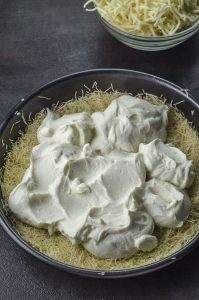 Knafeh – Move over cheesecake, there a new player in town! 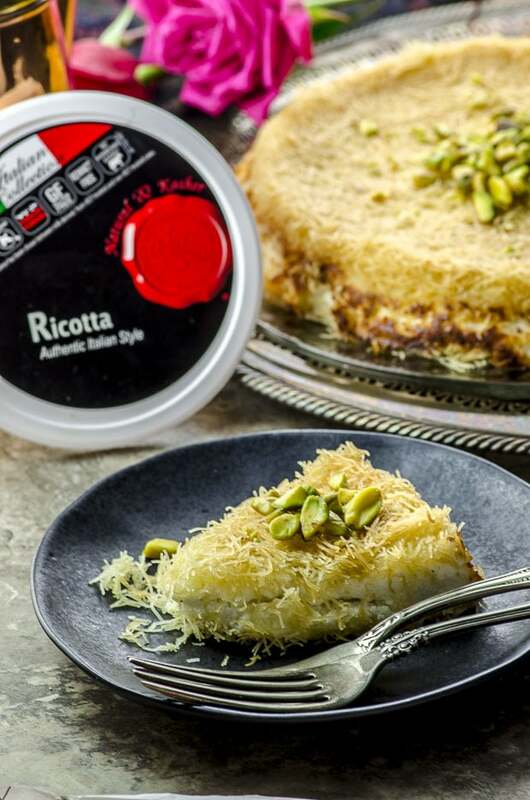 Sweet and incredibly delicious, our cheese Knafeh (ka-nee-fah) is a family favorite from Jerusalem that features shredded phyllo dough, ricotta, and mozzarella to create an fascinating dessert swimming in orange-blossom syrup and crushed pistachios. 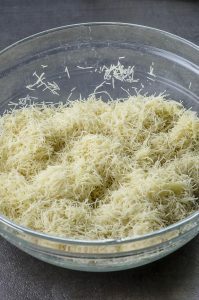 Spread the ricotta and sugar mixture and add the shredded cheeses on top. 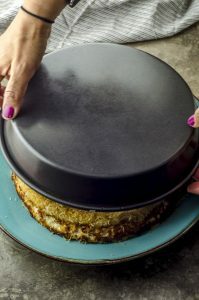 Place the rest of the buttered kataifi shreds on top, and gently press down. Bake for 40 minutes. 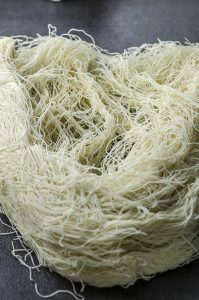 Kataifi is shredded filo dough than can be found online or in Middle Eastern and Greek specialty stores. As with phyllo dough, kataifi should the thawed in the refrigerator. Refreeze unused Kataifi. We found Natural and Kosher’s ricotta cheese to be specially smooth and creamy and it taste amazing! 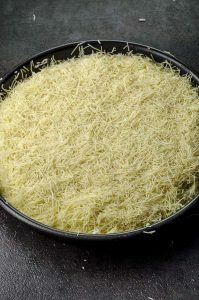 To make ahead: Knafeh can be made 2-3 days ahead and then baked. It can also be frozen unbaked, thawed and baked. I just got home from five weeks in Israel yesterday and I must say that knafeh is one of my hubby’s favorite treats. Yours looks so pretty! A perfect summer dessert.